This chapter aims to analyze the characteristics of Spanish governments that fail to achieve budgetary stability, as well as propose a model for the analysis of financial sustainability of governments that can help in predicting risk for financial sustainability. The analysis is focused on Spanish local governments with more than 5,000 inhabitants that have elaborated the annual plan because they did not achieve budgetary stability (79 local governments). Using the principal components analysis, the authors developed a model for the analysis of the characteristics of these governments. The model is made up of three components created from six indicators usually considered in the literature as relevant. The results evidence the indicators useful to measure the three dimensions identified by the IPSASB as relevant: revenue dimension, debt dimension, and public services dimension. Brusca, I., Olmo, J., & Labrador, M. (2018). Characterizing the Risk Factors for Financial Sustainability in Spanish Local Governments. 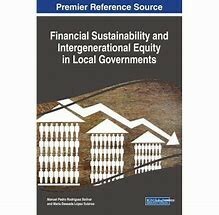 In Financial Sustainability and Intergenerational Equity in Local Governments (pp. 206-223). IGI Global.